Wednesday Night, on ABC News’ “Nightline,” investigative reporter Brian Ross showed a chilling–but not surprising–tape of Sheikh Issa bin Zayed al Nahyan, a prince in the United Arab Emirates’ ruling royal family, brutally torturing a man within inches of his life. Sheikh Issa’s brother Mohammed is the Crown Prince of the U.A.E. More details on the video and the story behind it here. The man being beaten, held down, and shot at by Sheikh Issa is a farmer, who the prince claims cheated him out of $5,000 of grain. For that alleged slight, Prince Issa forces the man to eat sand, beats him with a wooden plank with a nail on it, shoots at him, pours lighter fluid on the man’s testicles and sets them aflame, drives a nail through his buttock flesh, electrocutes him with a cattle prod, and then repeatedly runs over him with an SUV. Incredibly, ABC News anchor Terry Moran–brother of liberal pseudo-conservative hack blogger and Islamo-apologist Rick Moran–has the utter gall to compare this real torture to America’s “torturing” (which is nothing close to this) of no more than three Islamic terrorists–including Khalid Sheikh Mohammed and Abu Zubaydah–who were bent on our destruction. Brian, that is a shocking investigation, especially as our own country is engaged in a wrenching debate on torture. You Schmuck. We never did anything like this to terrorists. This is inhumane. And this man is a grain farmer, not a terrorist. That this Terry Moron has the nerve to compare our legitimate use of mild discomfort to find out terrorist plots against Americans, to the near-murder of a grain farmer is just plain sickening. This farmer miraculously survived, but he spent months in the hospital with massive internal injuries. We never did that–or anything close to that–to the terrorists we interrogated, who actually deserved it far more. When you see all the skyscrapers and fancy hotels of Dubai and hear how westernized it supposedly is, remember that several of those skyscrapers, including this one and this one, are owned by this barbarian, Sheikh Issa–whose other royal family members probably act the same way. 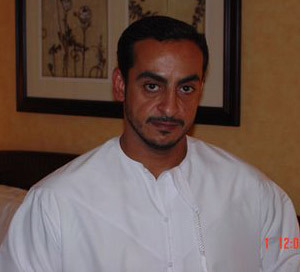 Some have even suggested he’s the “Milk Sheikh” from the Al-Nahyan family who “dated” (euphemism) bim Pamela Anderson. She’s so worried about animal rights, but apparently not so worried about her barbarian boyfriend’s treatment of humans. I’ve written about Sheikh Issa’s father, the late Sheikh Zayed bin Sultan Al Nahyan, the President of the U.A.E. until his death a few years ago. 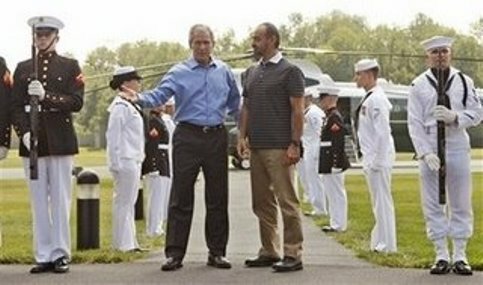 He gave a lot of money to President’s Bush’s loser brother Neil (of failed Silverado Savings and Loan fame) through his Zayed Center, which also funded anti-Semitic, anti-American, Holocaust-denial speakers and books, which claimed that the U.S., Israel, and the CIA were behind 9/11. The Al-Nahyans were the original 9/11 truthers. The tape of Sheikh Issa’s barbaric torture of a man for sport, was smuggled out of the U.A.E. by Bassam Nabulsi, a Muslim Arab businessman in Texas, who had a falling out with Sheikh Issa after the two did business together. It’s interesting how moral Mr. Nabulsi now acts, even though he did business with this barbarian for years. It’s a sure bet this isn’t the first time he’s seen Sheikh Issa do this. It’s on videotape, because Issa ordered his brother–the U.A.E. chief of police–to tape it so he could watch it over and over again with his friends for entertainment. He had his people insert the Arab musical soundtrack. The screaming is real. The tape is no surprise to me. This is how they are. They are barbarians, animals, complete scumbags. And this is to whom our leaders are buddying up. President George W. Bush welcomed this sadist to his Crawford, Texas ranch, when he was still President. Nabulsi, the man who smuggled the tape out of the UAE, is suing Sheikh Issa in federal court in Texas. The Sheikh’s lawyer represented President Bush in the 2000 Florida recount and is a partner with the pan-Arabist James A. “F-ck the Jews” Baker in the law firm, Baker Botts. Figures. These are the “people” of whom we are supposed to be tolerant, whom we are expected to call peaceful. Yup, just like the SS death camp guards were peaceful. Maybe, one day, when they make these videos of Muslims doing this on our own soil, we will wake up. But, then, it will be too late. It is already too late. Dubai is fast running out of oil, which is why it has focused on becoming a tourism destination. Since they are largely, therefor, no longer of value to us, why are we still sucking up to these barbarians? And where are Angelina Jolie, Brad Pitt, George Clooney, and all the other faux-humanitarian celebs–all of whom hang out in the UAE’s Dubai (where Brangelina owns property)? Strangely silent. Desert crickets chirping. Mohammedans? Yawn, what’s new??? Tell me something I don’t know!!! Nothing ironic about his name! Issa may be the Arabic for Jesus, and Mohammedans may have a Jesus in their texts. That Jesus is supposed to, on their judgement day, take up the sword and convert all Christians to Islam, and kill everyone else. Something I’m sure all Christians can identify with! Debi well we know muslims are sick in head. they will kill there owne mother. keep them out of are country. In the 200+ years of the USA’s existence, Khalid Sheik Mohammed deserved to have his knowledge of plans for mass murder extracted from him by force. This is what Muslims do. They are barbarians. That’s another reason to hate George -Islam Is A Religion Of Peace- Bush. He was an idiot. Not as bad as our current idiot but an idiot nonetheless. Mindy: FYI, wind and solar power are non-starters. That’s lefty pie-in-the-sky. The correct choices are oil and nuclear. The strategic path to victory in the war against Islamo-Fascist terror is the elimination of petroleum as the prime-mover of America’s transportation system. Keep your eye on the ball! Don’t let anyone distract you and remember where you heard this. Flash foward 50 years. Instead of local UAE farmer, substitute Dutch farmer, Swedish farmer, Norwegian farmer, French, Ontario farmer, Michigan farmer, Minnesota farmer. Think of this video as a crystal ball. What’s seen is the future of places in the Western countries which allow large-scale Muslim immigration. While we sputter and putter on what is and isn’t torture, those who want to kill us are laughing. They have NO regard for laws or civilized behavior. They view the debate as a sign of weakness. Could someone tell me why those on the left seem to always take sides with our enemies, tyrants and felons? Pity party for pirates starts in 5….4….3…. How ironic that Muslim cowards view this debate as a sign of weakness. The good Sheikh would cry and whine like the big woos he is if it were his balls on fire. Unfortunately, it is the Americans who have installed such regimes in all of the Arab coutries. President Bush for example is a dear friend to those Saudi and UAE Kings and Royal Families. King Obama kneeled to the Saudi King and kissed his hand. A thing he would not do to any one else in the world. The CIA and the MOSSADS protect those scums that are called Royal Families and recruit their subjects in Al Quaeda and other terrorists organizations to do terrorist acts in different countries including in America itself to suit their own political aims. The Arab people have suffered so much from such installed regimes. Saddam Hussein himself was installed by the US CIA, and they got rid of him because he had his own ambitions for the Arab people, unlike those scums that have no ambitions except to enjoy the fine things in life as they see them such as playing in Casinos, and screwing women all over the world, including in Las Vegas. looool all your posts made me laugh!! if a muslim does anythinh wrong…that doesn’t mean islam told him to do it..
am a muslim girl,and am proud..it’s the religion of mercy! Well I think you are brainwashed by the islamic Mein Kampf also known as the koran. If you say its the religion of mercy you must be a liar or just very naïve. Islam is as we know a fascist ideology. Anyway… can you give me some prove of your religions mercy? I only find killing, terror and slaughter about islam. U people don’t know Muslims at all!!! Just because of terrorists such as Issa or Bin Laden or however u think we are all the same! What about checking out what ur people have done to us! Check out what is happening in Iraq philistines…….. Since when did u care about us or others all u care is about ur selfsame u pigs! This Afghanistan man was tortured not even killed by a man that suffers from a sadistic personal disorder but thousands of Afghanistans are being murder by cruel soldiers! so SHUT UP! U people don’t know Muslims at all!!! Just because of terrorists such as Issa or Bin Laden or however… u think we are all the same! What about checking out what ur people have done to us! Check out what is happening in Iraq philistines…….. Since when did u care about us or others all u care is about ur selves u pigs! This Afghanistan man was tortured not even killed by a man that suffers from a sadistic personal disorder but thousands of Afghanistans are being murded by ur cruel soldiers! so SHUT UP!